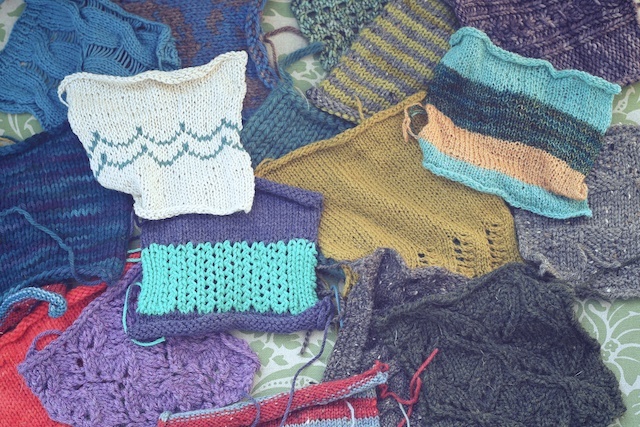 You're looking at some of my swatches that I've been gathering for a swatch blanket inspired by Ysolda's crazy swatch jumble in the pages of Little Red in the City. I'd read the beginning of Little Red in the City a couple of years ago when I first bought it. But, my reading stalled out at the alteration math. I hadn't modified my knits so much then, so I figured it was above my level and moved on to just look at the pretty pictures, I guess. Reading it over the winter with the Canary Knits ravelry group's Knitting Read-a-Long, I realized I not only "get" it, I've done my own modifications that require at least as much junior high math. So, I read through the entire book, then through the patterns and possible modifications. Can I just say that Ysolda seems so approachable- her book, her sometimes silly pictures, her teaching style. I can't get over her hand- drawn illustrations and text. It's like a friend sharing her Chem notes covered in doodles. Only, this isn't really like Chemistry class. The math is simple and supported by illustrations that keep your brain focused so it doesn't all read like an adult speaking in a Charlie Brown cartoon. Then there's the fact that both Ysolda and Amanda were a more realistic representation of how these sweaters would look on different bodies. Before this book, I hadn't seen any publications include different sized models for the same designs. A few tips stood out to me. One was to make sure the fit through the shoulders was correct, then alter other elements around that. I'd always gone by bust size, and it's mostly worked out for me, but I can see how this would provide a superior fit. Though needing to add bust shaping has never been an issue for me, and I can't see that it ever will, I do appreciate understanding how to approach short row bust shaping. Though it may not be a necessity, I may find that it compliments a design better than waist shaping. It never occurred to me that it should be handled differently depending on whether you're knitting top-down or bottom-up. There is no way I would've been able to guess that instinctively without trial and error. She has saved us hours of needless ripping out. There were two short row techniques I have yet to try, along with pointers on better hiding of turns. Though I've done a one row buttonhole, I liked the illustrations here. I will be using it as a quick reference next time I work those. So, my overall impressions from reading this are that I could stand to take a little more time considering my upcoming sweater projects. For instance, how is the fit in the shoulders? Would bust shaping allow for more room in other areas, while getting the best fit in the shoulders? How would shaping best be accomplished in the current stitch pattern? Is there any other design element I might want to change? I suppose it's about ownership. It's my time, my project; I may as well own it. 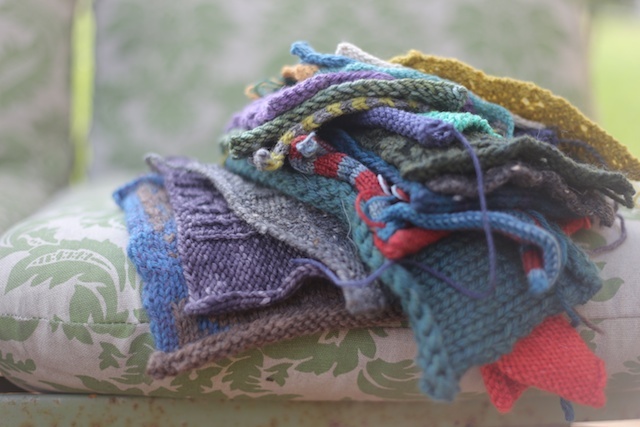 I also realized how much I have grown as a knitter. It all made sense this time. Having actually read the book, I'm looking at the patterns differently. There is much more to appreciate when you get a glimpse into the mind of the designer. Ysolda does a good job of that by including possible modifications and a little write-up on each design's inspiration. I hadn't seriously considered knitting Lauriel before because I didn't think it was my style; now, however, the gathered shaping looks really cute and like fun to work. As with all of these patterns, it has a seriously feminine vibe. The altered yoke sweater shape of Chickadee proves this by slimming down a classic sweater shape to better fit a woman's body. 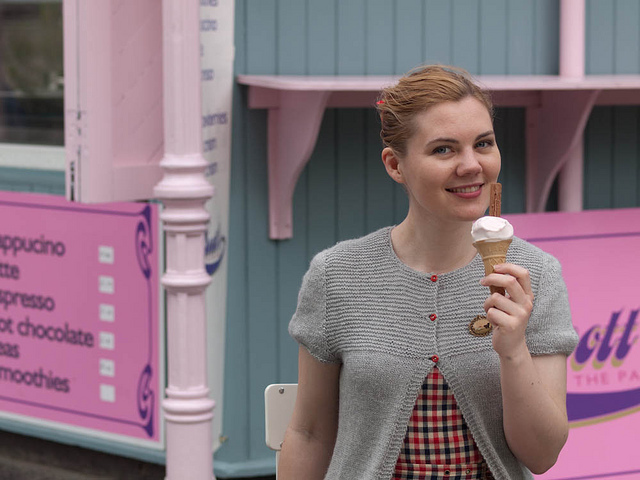 After having knit my own EZ percentage yoke sweater, I can attest to the troublesome, deep yoke and pouchy underarms of the typical yoke sweater. I'd really like to try the partial raglan shaping used here and see how it compares in fit. 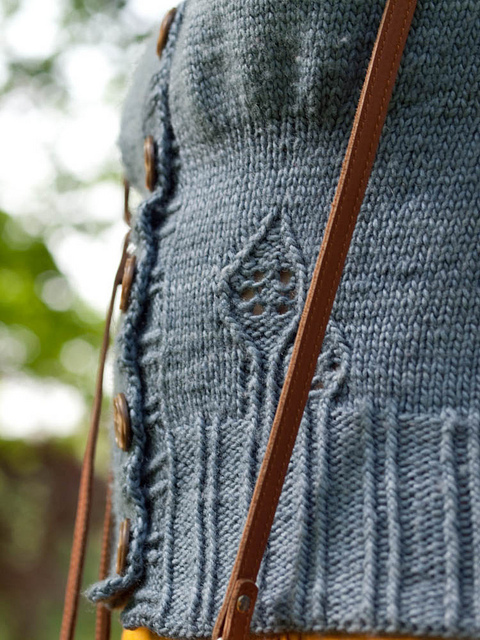 I'd love a short-sleeved Cria because it incorporates two of my favorite things- garter stitch and picking up stitches for a seamless knit. The inspiration on this top is really sweet, too. It was the pattern I wanted most when I bought this book. It's still my fave, with it's semi-raglan sleeves, faux seams, and double button placket, only now I get how innovative it is. 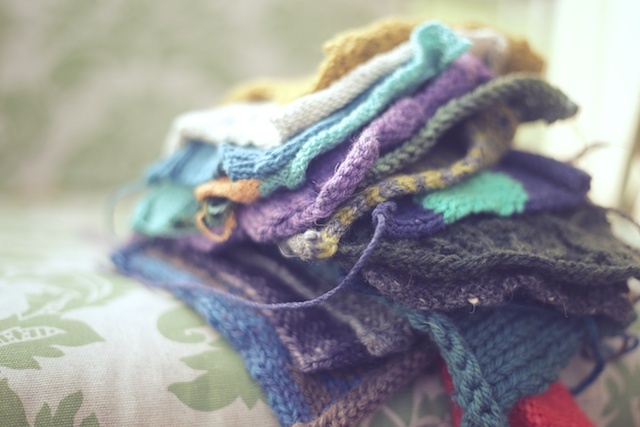 I love the idea of a knitting book read a long! I have this book and have used it for tips etc, but have yet to knit a pattern from it, I really should! I've never really heard of this book before but it sounds fantastic! 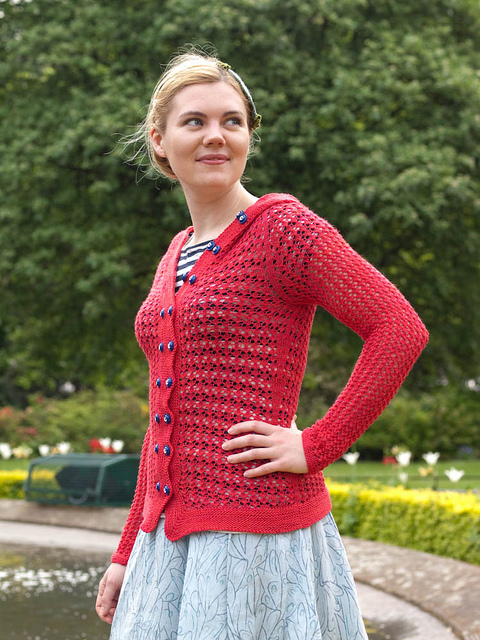 Also, I just completely fell head over heels in love with that Laika cardigan, I cannot believe I never stumbled upon this pattern before. This book has been on my list for ages. Thank you for your review, I hope I'll get it soon. I've been saving my swatches for the very same thing, only my swatches aren't nearly as interesting and beautiful as yours. I knit boring things. And then I decided that all the yarn bits I have that are left over from other projects should just be made into swatches just for a blanket. Also now I think I need this book. I've been waffling about buying this book for ages, and your post here is pushing it closer to the 'DO EET' side of the spectrum. :) Especially finding out just how much detail there seems to be in it. WOOHOO FITTING INFO!! Uh yeah, I might have to get on that. 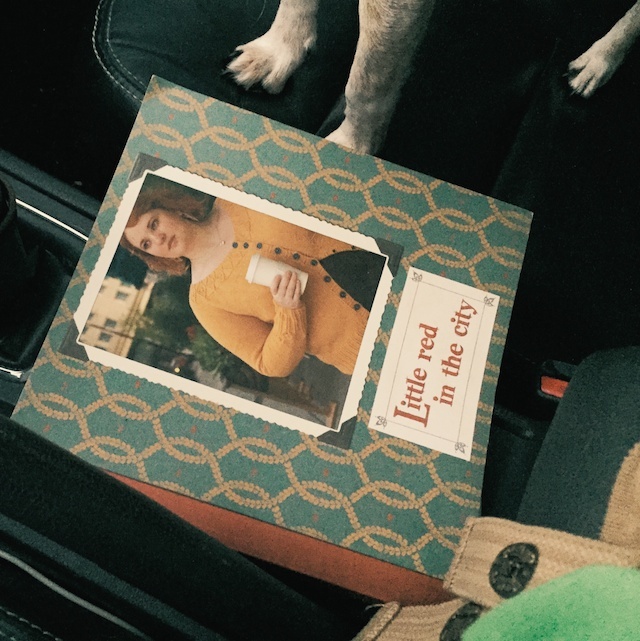 I love that book for fitting tips. I have yet to make one of the patterns and in my none breastfeeding life I'll never need bust shaping either, but I learn so much when I read it.